Early in the War of 1812, it became apparent that the existing militia system was woefully inadequate for the defense of Upper Canada. To rectify this situation, the Legislative Assembly of Upper Canada passed an Act creating the Incorporated Militia of Upper Canada. Volunteers from throughout the Province were to be formed into Battalions, and to serve for the duration of the war. The men received an eight dollar bounty, ten dollars towards buying "necessaries," and a possible land grant. Officers were to obtain their ranks by recruiting a specified number of men. Each Company was to consist of one Captain, a Lieutenant, an Ensign, three Sergeants, three Corporals, a Drummer, and 35 to 50 Privates. Pay and allowances were to be equivalent to those of the Regular forces. The government authorized a number of prominent applicants to recruit for several proposed 500 man battalions. Recruiting, however, was much slower than anticipated, largely due to the reluctance of the men to leave their farms or businesses for an undetermined time. 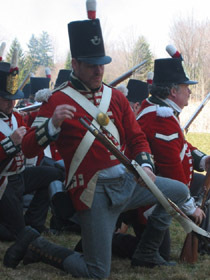 The first actions seen by the Incorporated Militia were by individual companies, or smaller detachments, scattered throughout central and eastern Upper Canada. At the occupation of York (April 27) Captain Jarvis was wounded and paroled. Another company was stationed at Fort George when it was attacked and captured (May 27). Following the Battle of Stoney Creek, the Americans retreated into area immediately surrounding Fort George, and made only occasional forays into the countryside. 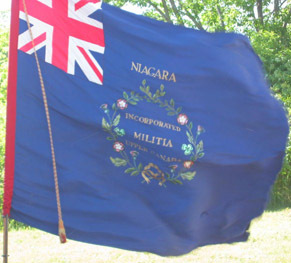 Various detachments of the Incorporated Militia were scattered throughout the Niagara Peninsula at that time. The siege continued until the Americans abandoned the fort in December, burned the town of Newark, and retreated to their side of the Niagara River. On the evening of December 18, the British carried Fort Niagara by storm. The Incorporated Militia were active in gathering the necessary boats, ferrying the troops, guiding the attacking columns, and taking part in the assault. They were also involved in the retaliatory burning of villages along the American bank of the Niagara River. In March of 1814, the various detachments were ordered to assemble at York. Recruitment progressed more quickly along the St. Lawrence river, due in large part to the greater concentration of Loyalists in that region. (By September 15, 187 all-ranks had been enrolled.) Among the tasks assigned to them were garrison duties, escorting supplies and prisoners, and constructing defensive works. At least two gunboats serving on the St. Lawrence River were commanded by officers of the Incorporated Militia. Captain Kerr commanded one such vessel on an unsuccessful expedition up Goose Creek, NY. The only major action in the region during 1813, was the American campaign to descend the St. Lawrence, and capture Montreal. The Incorporated Militia took over a large part of garrison duties at Prescott after a flying corps of regulars was dispatched in pursuit and defeating them at Chrysler's Farm. On February 6, 1814, a raid was dispatched to recover a quantity ofgoods captured the previous October; 23 Royal Marines and ten Militia(under Captain Kerr) crossed the river, impounded sleighs, traveled 14miles to Madrid (NY), seized the material, and returned without a shot being fired. As the volunteer system had not recruited enough men to fill, the January session of the Provincial Assembly enacted legislation to embody detachments from local militia regiments to raise an additional six hundred men. The existing companies of the Incorporated Militia were assembled a York in March 1814, and amalgamated into a single Battalion. Captain William Robinson of the 8th (King's) Regiment was granted the provincial rank of Lieutenant-Colonel to the new unit. Late in May, three hundred militiamen from local regiments were ordered to join the Battalion for a three month term. By the end of June it was felt that the Incorporated Militia was ready for field service. A return of June 22 lists, 29 officers, 27 sergeants, 11 drummers and 350 rank and file. It was then decided to dispatch the Incorporated Militia to the Niagara Peninsula. On July 6, 1814, the Incorporated Militia, "now in an admirable state of discipline" boarded two schooners and sailed from York to Fort George. They landed and marched to Queenston where they met the wounded and refugees from the Battle of Chippawa, an American victory. After spending several days, and having occasional brushes with, the American picquets, they joined the Glengarry Fencibles at Twelve Mile Creek as part of Lieutenant-Colonel Pearson's Light Brigade. On July 25, the Light Brigade led the British forces advanced southward along the Niagara River towards the enemy. At Lundy's Lane, they met the advance guard of the American army, and retreated about a mile, when they met General Drummond coming up with reinforcements. They returned to Lundy's Lane, and took up a position on the hill, at the left of the line. To their left was a patch of woods, and the river beyond it; to the right the 89th and other regiments. About 6 p.m. the battle began. The Incorporated Militia came under a heavy fire from the woods to their front and suffered several casualties, including Lieutenant-Colonel Robinson, wounded. About sunset, the American 25th Regiment passed through the woods on the Militia's left, and reached the road to the left-rear. The Incorporated Militia attempted to extend to meet this threat. It was, however, cut off, and many officers and men were captured along with the Battalion's ammunition wagon. This lack of cartridges forced the Militia to retire by companies. This was done in good order, despite the heavy fire. They rallied upon the Colours of the 89th, and took up a position facing the river. A silence fell over the field, broken only by the sound of maneuvering columns. Then the battle continued under a quarter moon. Both sides received reinforcements giving each a brief advantage. Volleys, charges and counter-charges followed as the Americans made repeated attempts to break the British line. At one point they took a British gun, but it was quickly recaptured. Throughout these engagements, companies or even sections, of the Incorporated Militia were active. After about three hours, the Americans made their last attack, launching several successive rushes. Repeated volleys drove them off, until the American commander finally decided his army had had enough, and withdrew to his camp beyond the Chipped River. The British likewise retired a short distance from the field. The Americans lost 171 killed, 573 wounded and 110 prisoners ormissing. The total British losses were 84 killed, 559 wounded, 42prisoners, and 193 missing. Of these the Incorporated Militia lost oneofficer (Ensign Campbell) and six men killed; four officers (Ensign John McDonell mortally) and 39 men wounded; five officers, three sergeants and 14 men prisoners; and 75 missing (most of these last returned to the ranks within a few days). Following the Battle, the Americans retreated to Fort Erie, which the Americans had captured in early July. They had, in the intervening time, greatly strengthened the defenses there. The British drew a cordon around the fort, planted outposts, erected batteries, and began bombarding the fort. This activity was interrupted by almost daily skirmishes amongst the outposts, and sallies by the Americans, which often accelerated into sizable engagements. One such came on August 12, in which both the Incorporated Militia and the Glengarry Fencibles suffered several casualties (including Captain Edward Walker killed). The most dramatic episode of the siege was the assault on the fort on the night of August 15. This ended in a costly reverse and over 500 British casualties. The Battalion was fortunate in being placed with the picquets and covering parties on that night. Another sally from the fort came on September 4, but was in the words of one participant, "Repulsed with Considerable loss, the loss on our part but trifling." On that day, heavy rains began, which continued until the camp became a quagmire. The besiegers suffered terribly as many were without tents. The Incorporated Militia used their pioneering skills to quickly erect snug shanties for themselves. On September 17, the Americans launched their biggest sally, involving some 5000 men. They drove in an outpost, and captured a battery which they damaged heavily. A fierce struggle ensued, as companies from the British reserve were thrown into the fray, until the Americans were checked and retired into the fort. 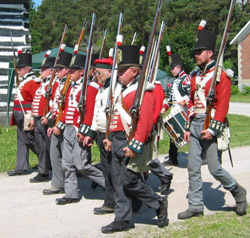 On September 21, the British ended the siege and retired to positions along the Chippawa and Black Creeks. The Battalion was amongst the troops in the forward positions. It was also employed in threshing out the grain in front of the lines in order to deny it to the enemy. By October 10, the forward posts were withdrawn, and the British feverishly built a series of defensive works along the various creeks making up their defensive lines. The pioneering skills of the Incorporated Militia were particularly noted. The American army approached these works, but felt them too strong to be taken. On October 24, the British reorganized their forces, and the Battalion was sent to Butler's Barracks, prior to their return to York. A return of November 22 gives their strength as 199 all ranks at Butlers, 90 stationed elsewhere, and 39 as prisoners of war. While in winter quarters, the Battalion was recruited up to strength. The Legislative Assembly passed a series of acts raising the Bounty to ten pounds, and £9000 was allotted towards recruiting and other expenses. Major-General Drummond recommended a change of uniform to a less conspicuous green, and that the men be entitled to bear "Niagara" upon their Colours and appointments. During this time officers were appointed to fill up the vacancies. New Lieutenant-Colonels included Colonel Tucker on November 5, and Captain Glew (41st Foot) on February 25, 1815. During February 1815, news of the ratification of the Treaty of Ghent, which ended the war, reached Canada. On March 10, a Militia General Order directed that all militia regiments were to return to their homes on the 24th of the month. The Incorporated Militia was particularly complimented on their "Steadiness and good Conduct on all occasions." They were also granted a month's pay, free of deductions, as an allowance to see them to their homes, plus an additional six months' pay as a reward for their services. On April 23, 1822, the long promised Colours were presented at a ceremony at York, and lodged into the care of the local militia. Inscribed "Niagara" they are currently in the National War Museum in Ottawa.